When the original Wimbledon FC made their Football League debut in 1977, nobody would have predicted the eventful 25 years that followed. Just nine years after attaining League status, the Wombles reached the top flight. They won a memorable FA Cup Final against overwhelming favourites Liverpool in 1988, and were one of the clubs that took part in the controversial top-flight breakaway to form the Premier League in 1992. Things looked rosy, but the good times would not last. In 2001, with the club having been relegated a year earlier, the board announced its intention to relocate to Milton Keynes, a proposal that was strongly opposed by supporters and both the FA and Football League. This opposition did not prevent an independent commission rubber-stamping the move in May 2002, a decision that proved the last straw for many Wimbledon supporters, who formed a new club, AFC Wimbledon, to continue the spirit of the old Wimbledon even as the legal entity headed north. 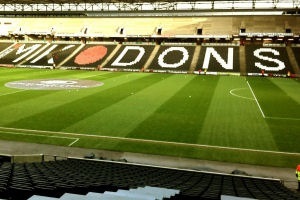 The relocated club, known as Milton Keynes Dons since 2004, did try to claim Wimbledon's history and heritage for a while; few were ever convinced, and these claims were renounced in 2007.